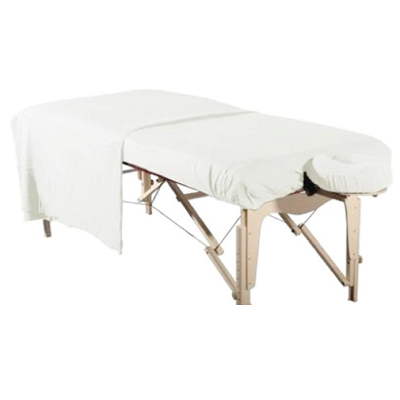 There is nothing like deluxe flannel sheet to make for a great massage experience and these covers are designed for comfort, fit, and extended use. these soft 100% polyester blushed flannel sheet set offer an increased size on all prices. 1 Fitted Sheet (7.5" drop-36"x78"): fits tables up to 33" wide and fully wraps sides. 1 Flat Sheet (61"x100"): generously oversized and measures 58"x88" to easily cover your larger clients. 1 Headrest Cover (15"x6"): is designed for comfort and protects your headrest from facial oils and makeup.